A dual-branded Novotel and Ibis hotel complex will next week open its doors in the downtown Bangkok city area of Sukhumvit, AccorHotels has announced. The Novotel Ibis Styles Bangkok Sukhumvit 4 is being positioned as a dual business and leisure destination and is surrounded by the city’s major attractions, shopping centres and a pair of accessible BTS Skytrain stations which link travellers directly to the city’s main airports. 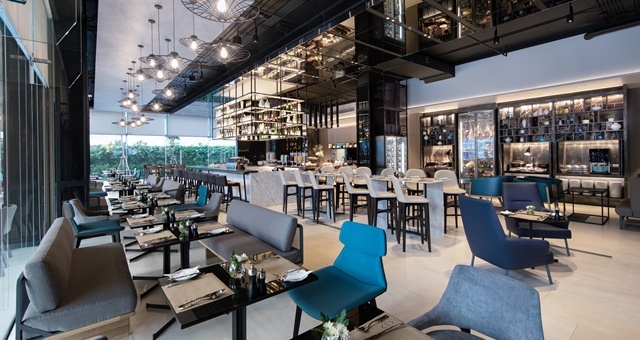 In partnership with the Erawan Group, the dual-branded concept gives guests a choice between AccorHotels’ midscale and budget-conscious options under one roof. The Novotel Bangkok Sukhumvit features 185 Deluxe and Grand room options overlooking the city skyline. Each rooms offers unique wall art, abundant natural light, smart television with connectivity panel. All rooms are fitted with Novotel’s ‘N Room Concept’ and the eco-designed ‘Live Dream’ bed which is made from 100% recycled bottles. Over the way, the 133-room Ibis Styles Bangkok Sukhumvit offers double and twin bedding, with all rooms including breakfast and free wi-fi. The property opens to guests on October 01, 2018.